Have you considered a Outdoor Kitchen Virginia or Pool House? The appearance of your outdoor space can be greatly improved with the addition of an outdoor kitchen or pool house. When people visit your home for outdoor gatherings, they don’t notice the interior. They naturally focus exclusively on your outdoor space. That’s the reason a home improvement project that revolves around your outdoor environment can be such an amazing idea. There are so many thrilling ways to update the look and feel of your outdoor setting. People look forward to the warmth of the summer months all year long. The summer months are a time to celebrate the outdoors. If you want to take advantage of your outdoor property in times of pleasant temperatures, an outdoor remodeling project can be a fantastic idea. It can be a blast to design and construct an outdoor kitchen. What can be more enjoyable than preparing delicious meals under the gentle warmth of the sun? Outdoor kitchens can make planning and pulling off outdoor events of all types a lot easier and more efficient. Outdoor kitchens can be great for birthday bashes, pool parties, evening dinners and more. Backyard pool houses are yet another terrific home improvement option. A pool house can serve as a lovely sanctuary for people who like swimming. If you have a hot tub or swimming pool in your backyard, the addition of a pool house may be well worth your energy. There are many other ways to improve your outdoor space, too. It can be a joy to build a deck. Decks can be amazing places for people who like entertaining guests regularly. It can be a pleasure to invest in gazebos, fountains and retaining walls as well. It doesn’t matter what your tastes are. You should be able to discover outdoor space renovation options that perfectly suit you and the rest of your household. Water features can be fantastic for people who want their outdoor spaces to look and feel peaceful and welcoming. We’re a proud Virginia firm that specializes in top-quality home improvement services of all kinds. 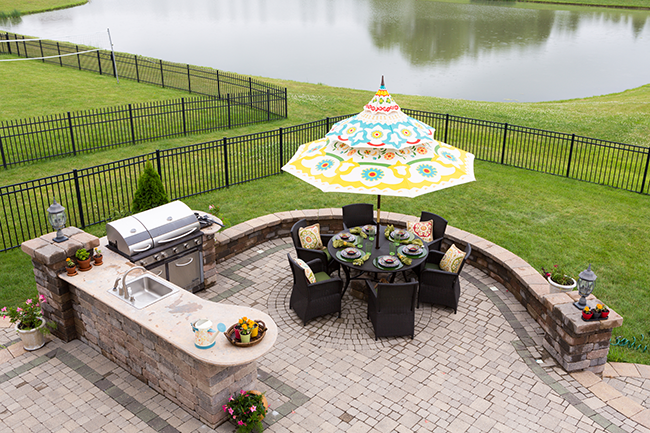 If you’re looking to renovate your outdoor space in Virginia, our skilled team members can save the day. Call the Beckworth team any time to ask us questions about our outdoor kitchen Virginia renovation skills and abilities. Call us to book an appointment. If you’re considering a Outdoor Kitchen Virginia feel free to give us a call for a free quote (703) 570-6777, or Contact us here. You can also find good resources on our Blog or Facebook.